Does Facebook Actually Limit Your Posts to 26 Friends Only? 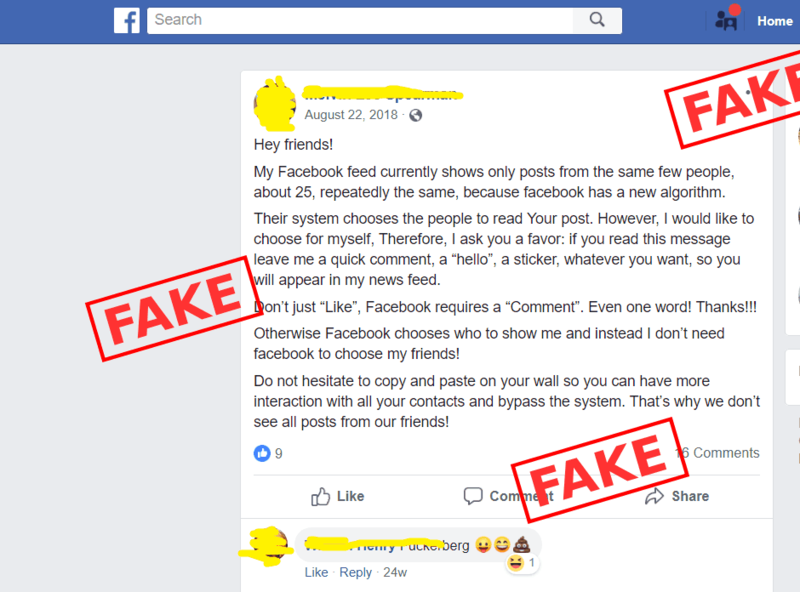 There have been many posts circulating on Facebook asking to comment on the posts because Facebook's new algorithm is limiting the post interaction. According to these posts, a specific number of people can view your posts in their News Feed which Facebook selects itself. Many users might be believing the post, but it is not entirely true. The social media platform clarified the issue saying that its algorithm does not specify the number of friends who can see your posts in News Feed. To further explain it, Facebook says it posts you see are ranked in a way that is believed to be of your interest. There are chances that you see posts from the same people again and again at the top of the News Feed, which is based on your interest only. More posts from other people can be seen by scrolling down the screen. Instagram faced the same challenge when myth spread that its post reach is only 7%. Instagram had to give clarification saying that you see posts based on people you follow, your engagements and on how many times something is posted. Instagram’s algorithm has not set any limit of post engagement, it is on the basis of your interactions on the platform. The more you like or comment on posts of your friends and family you followed, so will be your engagement level with them and their posts showing on top of Feed. To see posts of people, you need to interact with them, comment on their posts regularly or more often. Only them your post reach can be improved. Facebook says they have given users full control over what they want to see and set priorities. There is a SEE FIRST feature which let you choose the person you want to see posts of at the top of your Feed. You can UNFOLLOW someone if you are seeing too many posts from that profile. There is also a SNOOZE button which let you remove their posts from your News Feed for 30 days. News Feed algorithm of Facebook is not difficult to understand. It could be tricky for brands, as they need to create engaging content to stay relevant to users. To produce content while sticking to the offering of your brands could be difficult for gaining likes or shares. The more people you actively engage, the more you will be seen on the Feed. Not just for brands, this same implies for other users also. But Facebook would prefer engagements with brands or business pages more rather than among people. There could be various theories circulating on Facebook that might not be entirely true. Moreover, there are sources available online to read more about how the algorithm works.